Our wireless hand held will work with all our wireless scale products, top of jack cells and our wireless platforms. Our HH2400 series indicator uses 2.4 Ghz transmission, has excellent range and is so easy to use. Weighing a large jet has never been so easy. You can position the equipment and conduct the weighing in place, no need to move the aircraft, place equipment and secure a tug to tow the aircraft into position. 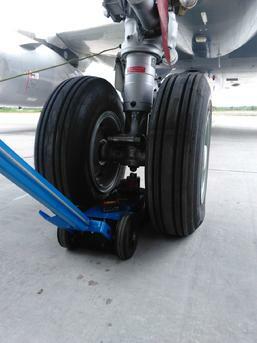 Our equipment gives many airlines and MRO operations a cost effective choice to conduct weighing. Our laptop computer wireless units can produce a full screen shot and printed report. Live tiles shows all scales in use as well as your total weight. Our wireless handheld HH2400 unit can be used with our large jet kits. The kit below for Gulfstream, RJ's, Global and many other large corporate and airline jets. 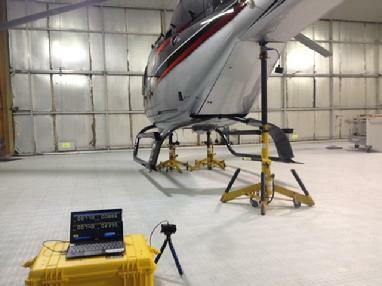 Airbus EC120 being weighed on our M2400 wireless series scale system. M2400 series wireless scale systems are available in many sizes from helicopter applications all the way up to the Boeing 737. Our new JAWS 100 1.2.2 software package is loaded with features, full screen display, full programing capability, advanced math functions, and now capable of connecting to your wireless network. Wireless interface allows the user to connect to your wireless network in your facility, you can now use your connected Ipad, Iphone or Android device to see your scale readings by several users all at the same time. Our UAV/UAS/DRONE wireless weighing pack up systems are now in full production. 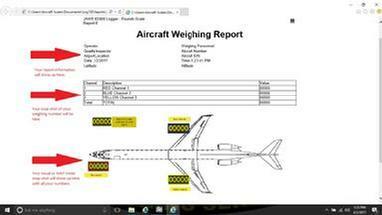 Meet the FAA 55+/- rule in weight, certify for airworthiness, certify for exemptions. WWW.AIRCRAFTSCALES.COM is an industry leading scale manufacture for all manufactures and military unmanned aircraft applications. Call us today to discuss your needs and or specifications, chances are that we have a scale system suited for your operations. Check out our new Wireless Aircraft Scales, Laptop Computer included.